he finds it attached to the rest of the world. Summer begins and the life of our bodies open to the possibilities of new growth. Nature is at her fullest, and our garden begins to bring us nourishing food and the comforting realization that what we plant in our soil does come to fruition. As we continue to grow, there are times when listening to nature can speak volumes to us. Watching a seed become a gift of nourishment shows us that with love and care, great growth can happen. Our bodies are like that as well. These next three weeks I will be deep in the desert connecting with my own summer growth – an opportunity to let go and just be. How often are we simply being or allowing? Plants in a garden do exactly what they are supposed to do – grow. Can we stop and listen to what nature is speaking to us? Step out into the natural world – forest, beach, your back yard. Take a deep breath and plant your bare feet on the earth. Feel the earth under your feet. Stretch your arms up and open your eyes to the sky. Connect with the sky and the earth – like the plants growing in your garden. Ask yourself, How does my garden grow? I am happy to announce that I will be holding a workshop for women with Somatic Coach and Recreation Therapist Sandy Sagraves October 15–18, 2009. 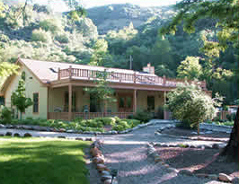 We will be nestled-in at the beautiful Saratoga Springs Retreat Center in Upper Springs, California. Look for more information in my next SomaNews. Allied Ronin, founded by Lance Giroux in 1994, is a premier leadership and team development firm serving clients internationally. I work with Lance at the firm’s semiannual Leaders Retreat and annual Couples Retreat, designed for individuals and couples who are mindful of service, spiritual depth and the larger concerns of life, and who are sincere about the interplay of self, family, business and community. Attendees relax, rejuvenate and engage in a series of dialogues and exercises, including the somatic bodywork and practices that I bring to support a capacity for effective action. Learn more about Allied Ronin at http://www.alliedronin.com. I would love to hear from you. Feel free to call or send an email.